Don’t expect University of Wisconsin-Green Bay Professor Harvey J. Kaye to go “all Hollywood” on us just because he is appearing on national television next week. In fact, for Kaye, one of UW-Green Bay’s longest standing faculty members, it’s more of the same — sharing with an audience (albeit a much larger one) his passion for the “Four Freedoms” and not losing sight of what made the “greatest generation” truly great. 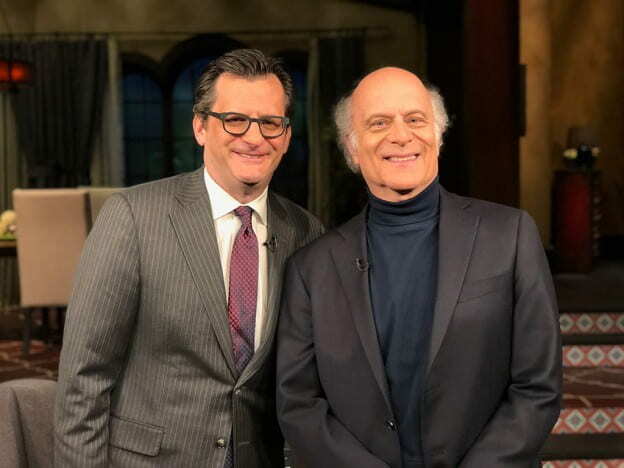 The difference this time, is that Kaye joins Ben Mankiewicz, for a national television broadcast on TCM (Turner Classic Movies). The duo will present five films, beginning at 7 p.m. (CST) Monday, May 21, 2018, that illustrate the inspiration of Kaye’s book: “The Fight for Four Freedoms.” The Four Freedoms were President Franklin D. Roosevelt’s goals for America, given in his 1941 State of the Union address, preceding the United States’ entrance into WW II. The evening coincides with a restored 75th anniversary edition of Norman Rockwell’s series of paintings, “The Four Freedoms.” The exhibit is “Enduring Ideals: Rockwell, Roosevelt & the Four Freedoms), which will be on display May 25 to September 2 at the New-York Historical Society before touring as an international traveling exhibition through 2020. (For more information, please visit the Norman Rockwell Museum and the New York Historical SocietyMuseum). Kaye is also serving as a historical advisor for that exhibit. For Kaye, the Director of UW-Green Bay’s Center for History and Social Change, the television spot and the touring exhibit are avenues to reach a much broader audience, helping them to understand why the “Greatest Generation” (born in the early 1920s, and fought in, died for, and lived through, WWII) is aptly named. “For all the talk about the “Greatest Generation” including books and movies, they all ignore the Four Freedoms,” Kaye said. “What struck me is the amnesia that America seems to have about the cause for the war. Every production seems to show the soldiers’ motivation was survival, but what they were really fighting for was a better America when they came back. It’s important to me that we not only remember their sacrifice but their legacy decades later. Kaye, the author of 10 published books on history and politics, has contributed articles to such publications as The Washington Post, The Daily Beast, Salon and Huffington Post; and has appeared on numerous TV and radio programs including Bill Moyers Journal and Here and Now. Despite the fame, and the national exposure, don’t expect to see Kaye outside his “branded look” of blue turtleneck, blazer and blue jeans. Not around Monday night? Set your DVR for what Kaye considers some of the greatest movie and film viewing of all time. This entry was posted in Leading & Learning and tagged CAHSS, Center for History and Social Change, Democracy and Justice Studies, Historical Perspectives Series on May 16, 2018 by Sue Bodilly.